The objective of this study was to review literature focused on the introduction of Brazilian oral healthcare service models, incorporation of Oral Health Teams (OHTs) within the Family Health Strategy (FHS), changes occurring in the work process of the professionals that make up OHTs, difficulties for successful implementation of this new healthcare model and impacts on indicators of oral health. A review of the literature was conducted through an electronic consultation of the Pubmed and Virtual Health Library (VHL) databases published between 2001 and 2016, using a combination of descriptors. We selected 44 studies for review. Oral healthcare in Brazil evolved from exclusionary and curative models to those aimed at prevention and promotion of health. The increase in government resources dedicated to oral healthcare in Brazil represented an improvement in access to dental treatment, however, some studies demonstrated that OHTs within the FHS still operate by the traditional curative models. Lack of proper planning for hiring OHTs and precariousness of their work contracts were also reported. The need for better managerial planning for implementation of OHTs within the scope of the FHS was demonstrated. Keywords: Dental Health Services, Dentists, Family Health Strategy, Oral Health, Primary Health Care, Unified Health System. © 2018 Colodette et al. In 1994, the Ministry of Health of Brazil (MoH) proposed the implementation of the Family Health Program (FHP), intending to strengthen the Unified Health System (UHS), which aimed at restructuring primary health care in the public health system, prioritizing actions of prevention, promotion and recovery of the health of the population from a surrounding area [1Brasil Ministério da Saúde Programa Saúde da Família 1994.]. Subsequently, the program was consolidated as a Family Health Strategy (FHS), aiming at the reorganization of the Brazilian Primary Health Care (PHC), with no defined duration [2Brasil. Ministério da Saúde. Portaria n° 648, de 28 de março de 2006. Aprova a Política Nacional de Atenção Básica, estabelecendo a revisão de diretrizes e normas para a organização da Atenção Básica para o Programa Saúde da Família (PSF) e o Programa Agentes comunitários de Saúde (PACS). Brasília. Diário Oficial da União, 29 Mar, 2006.]. Initially, the family health team consisted of a physician, a nurse, a nursing assistant and community health agents [1Brasil Ministério da Saúde Programa Saúde da Família 1994.]. Nevertheless, the population continued to lack access to dental services, and the 1998 National Household Sampling Survey (PNAD in Portuguese) showed that, until then, almost 30 million Brazilians had never visited the dental surgeon [3Lourenço EC, Silva ACB, Meneghin MC, Pereira AC. The insertion of oral health services in the Family Health Program at Minas Gerais State, Brazil. Ciênc. Saúde Coletiva 2009; 14(Suppl. 1): 1367-77.]. The official insertion of dentistry in the FHS occurred on December 28, 2000, through Ministerial Order No. 1,444, which established a financial incentive for the reorganization of Oral Health (OH) provided by municipalities [4Brasil. Ministério da Saúde. Portaria n° 1.444, de 28 de dezembro de 2000. Estabelece o incentivo financeiro para a reorganização da atenção à saúde bucal prestada nos municípios por meio do Programa Saúde da Família. Brasília. Diário Oficial da União, 29 Dez, 2000.]. Months later, ordinance 267, dated March 6, 2001, regulated this insertion [5Brasil. Ministério da Saúde. Portaria n°267, de 6 de março de 2001. Define as diretrizes e normas da inclusão das ações de saúde bucal no PSF. Brasília. Diário Oficial da União, 07 Mar, 2001.]. The purpose of this incorporation was to reorganize the dental care model, expand the population's access to oral health services, and increase preventive actions [4Brasil. Ministério da Saúde. Portaria n° 1.444, de 28 de dezembro de 2000. Estabelece o incentivo financeiro para a reorganização da atenção à saúde bucal prestada nos municípios por meio do Programa Saúde da Família. Brasília. Diário Oficial da União, 29 Dez, 2000.]. With this, the dental surgeon's work process incorporated new assignments, including actions that prioritized the promotion of individuals and families in a comprehensive, interdisciplinary way, and performed not only in the Basic Health Units (BHU) but also in community spaces and households [6Moraes LB, Kligerman DC, Cohen SC. Analysis on the socio-demographic profile and dental surgeon’s work process in the Family Health Program, in three cities of the mountain region of the state of Rio de Janeiro. Physis 2015; 25(1): 171-86. [http://dx.doi.org/10.1590/S0103-73312015000100010] ]. The financial incentive provided by the MoH and the possibility of reorganizing the oral health actions were pointed out as stimulators of the incorporation of the Oral Health Teams (OHT) in the FHS [7Mattos GCM, Ferreira EF, Leite ICG, Greco RM. The inclusion of the oral health team in the Brazilian Family Health Strategy: barriers, advances and challenges. Ciênc. Saúde Coletiva 2014; 19(2): 373-82. [http://dx.doi.org/10.1590/1413-81232014192.21652012] ]. However, it has been questioned whether the OHT has fully contemplated all UHS guidelines, pointing to challenges related to, for example, the lack of professional qualification, the lack of integration of the OHT with the rest of the family health team, and the existence of a suppressed demand, left by years of excluding assistance models [6Moraes LB, Kligerman DC, Cohen SC. Analysis on the socio-demographic profile and dental surgeon’s work process in the Family Health Program, in three cities of the mountain region of the state of Rio de Janeiro. Physis 2015; 25(1): 171-86. [http://dx.doi.org/10.1590/S0103-73312015000100010] , 8Souza TMS, Roncalli AG. Oral health in the Brazilian Family Health Program: A health care model evaluation. Cad Saude Publica 2007; 23(11): 2727-39. [http://dx.doi.org/10.1590/S0102-311X2007001100020] ]. In spite of these questions, oral health has been assuming a prominent position in the last years, providing the widening of the population access to dental care and enabling an improvement of this aspect in the epidemiological framework of the Brazilian population [9Costa RM, Medeiros-Júnior A, Costa ICC, Pinheiro IVA. Working process of dentist in the family health strategy of parnamirim-RN: Facing the challenges of a new care model. Rev Odontol Bras Central 2010; 19(51): 327-32.]. By 2015, 24,467 OHT had been implanted throughout Brazil [10 Brasil. Ministério da Saúde. Departamento de Atenção Básica. Histórico de cobertura Saúde da Família. Disponível em: http:// dab.saude.gov.br/ portaldab/ historico_cobertura_sf.php Acesso em: 17 nov. 2016. ], and the number of first consultations had already reached approximately 30 million [11 Brasil. Ministério da Saúde. Sistema de Informações Ambulatoriais do SUS (SIA-SUS). Disponível em: http:/ /www2.datasus.gov.br/ DATASUS/ index.php?area=0202& id=19122&VObj=http://tabnet.datasus.gov.br/cgi/deftohtm.exe?sia/cnv/qa Acesso em: 17 nov. 2016. ]. Few studies, however, address the impact of OHT on epidemiological indicators and dental services [12Pereira CRS, Roncalli AG, Cangussu MCT, Noro LRA, Patrício AAR, Lima KC. Impact of the family health strategy: An analysis in cities in Northeast Brazil with more than 100,000 inhabitants. Cad Saude Publica 2012; 28(3): 449-62. [http://dx.doi.org/10.1590/S0102-311X2012000300005] ], and there is little scientific evidence of the beneficial impact produced by the OHT [13Ely HC, Abegg C, Celeste RK, Pattussi MP. Impact of oral health teams of the Family Health Strategy on the oral health of adolescents in the south of Brazil. Ciênc. Saúde Coletiva 2016; 21(5): 1607-16. [http://dx.doi.org/10.1590/1413-81232015215.07822015] ], since “the issue is not just the coverage amount, it is logical and of care organizational quality” [14Farias MR, Sampaio JJC. Role of the dental surgeon in the family health team. RGO -. Rev Gaucha Odontol 2011; 59(1): 109-15.]. Based on these considerations, the present study aims to analyze, through a literature review, (i) the evolution of oral health care models, (ii) the insertion of OHT into the FHS, (iii) changes in the work process of the professionals from the team, (iv) the difficulties for the success of this new care model, and (v) the impacts on oral health indicators. A review of the literature was conducted through an electronic consultation of the Pubmed and Virtual Health Library (VHL) databases, searching for articles published between January 2001 (year of the OHT implantation into the FHS) and July 2016. Combinations of the following descriptors were used: (1) Family health, (2) primary health care, (3) dentistry, and (4) oral health, in Portuguese and English. Articles in English, Portuguese and Spanish were selected (Table 1). The review included original studies, case reports, bibliographical reviews and theoretical reflections fully available, which included information on Brazilian oral health policies, the process of the OHT insertion into the FHS, the work process of oral health teams, the impacts on oral health indicators and the comparison of these indicators between areas covered and not covered by the OHT. To include studies of comparable quality, only data published in peer-reviewed journals were considered. Studies on dental programs in other countries, comparative studies of OHT from the same municipality, users’ evaluations of a single OHT, studies evaluating the profile of dental surgeons in a municipality (whether or not members of the OHT), studies that analyzed evaluation programs or instruments, studies carried out exclusively on dentistry graduate courses, and on the profile of the OHT users were excluded. Combination of the descriptors and numbers and quotes identified in the databases. Two reviewers independently conducted the research and selection of the studies. The divergences in all steps of the study selection were resolved by consensus. Fig. (1 ) describes the selection steps of the studies and the number of articles included in each of them. After the selection, the articles were read and the main results were recorded on a form. Articles that did not present all the information had the author contacted, at least twice, for the due questions. The articles were read and the results were divided into four categories: historical development of Brazilian oral health policies and their financing; Working process of Oral Health Teams; Oral health indicators after OHT implantation into the FHS and comparison between areas with and without OHT; and Challenges of the OHT in the FHS. The study included, for discussion, some Ministerial Ordinances referring to the OHT in the FHS, as well as the guidelines of the National Oral Health Policy (PNSB) and the National Curricular Guidelines of the Dentistry Graduate Course. Fig. (1 ) describes the number of articles included in each of the study selection steps. 2709 papers were screened, of which 2622 were excluded from the reading of the titles. After the initial evaluations, 87 abstracts were reviewed and, from them, 46 complete articles were analyzed, of which 44 articles were included in this systematic review. Of the 44 studies included, 31 were characterized as original articles, 12 were critical and documentary reviews and 1 case study. The results and discussion are presented below. Dental care in the Brazilian public network was characterized, for years, by assistance models that prioritized restricted population groups [15Santiago WK, Werneck MAF, Ferreira EDE. The process of implementing dental care with in the family health care program in Belo Horizonte/MG: A qualitative study based on the perception of the oral health care coordination team and dental surgeons from the family health care program. Arquivos em Odontologia 2009; 45(4): 211-9., 16Oliveira JLC, Saliba NA. Dentistry attention in the Family’s Health Program (FHP) in Campos dos Goytacazes. Ciênc. Saúde Coletiva 2005; 10(Suppl. ): 297-302. [http://dx.doi.org/10.1590/S1413-81232005000500030] ], leaving for the rest of the population merely curative and mutilating services [16Oliveira JLC, Saliba NA. Dentistry attention in the Family’s Health Program (FHP) in Campos dos Goytacazes. Ciênc. Saúde Coletiva 2005; 10(Suppl. ): 297-302. [http://dx.doi.org/10.1590/S1413-81232005000500030] ]. An important example of this type of model was the Incremental System, implemented in Brazil in the 1950s by the Foundation for Public Health Special Services (SESP), which represented a milestone in Brazilian free dental care, however, restricted its preventive actions to fluoridation of public water supply and prioritized the restorative treatment of schoolchildren [17Nickel DA, Lima FG, Silva BB. Dental care models in Brazil. Cad Saude Publica 2008; 24(2): 241-6. [http://dx.doi.org/10.1590/S0102-311X2008000200002] ]. Subsequently, this model was replaced by the Integral System (or Modified Incremental), which, in practice, did not present substantive changes in relation to the previous one. Due to the criticism of these models, the Attention Reversal Program (or Universal System) emerged in the late 1980s. This new model decentralized the classic curative attention and sought to control the disease before beginning the definitive restorative treatment. However, despite having been implanted in several municipalities with the intention of “covering the flaws” of the curative Incremental System, it did not take into account the real epidemiological needs of the population [17Nickel DA, Lima FG, Silva BB. Dental care models in Brazil. Cad Saude Publica 2008; 24(2): 241-6. [http://dx.doi.org/10.1590/S0102-311X2008000200002] ]. With the creation of the UHS in 1988 - which had as its principles the attention universality, integrality and equity - it was no longer possible to admit the exclusion of clienteles. The UHS sought to “reduce the remaining distances between social rights guaranteed by law and the effective capacity to offer public health services” and had the challenge of obtaining the financial resources to keep the system functioning [16Oliveira JLC, Saliba NA. Dentistry attention in the Family’s Health Program (FHP) in Campos dos Goytacazes. Ciênc. Saúde Coletiva 2005; 10(Suppl. ): 297-302. [http://dx.doi.org/10.1590/S1413-81232005000500030] ]. PNAD, conducted by the Brazilian Institute of Geography and Statistics (IBGE) in 1998, pointed out that, at that time, about 30 million Brazilians had never gone to the dentist [4Brasil. Ministério da Saúde. Portaria n° 1.444, de 28 de dezembro de 2000. Estabelece o incentivo financeiro para a reorganização da atenção à saúde bucal prestada nos municípios por meio do Programa Saúde da Família. Brasília. Diário Oficial da União, 29 Dez, 2000.]. These data “revealed to Brazilian society information that, from the ethical point of view, confronted the role of the State as provider of actions and health services” [18Cruz DB, Nascimento AC, Moysés SJ, Ditterick RG, Gabardo MCL. Working process in the family health strategy: a perspective from the oral health team. Rev APS 2009; 12(2): 168-75.]. In this context, the MoH proposed, as a strategy to reorganize the PHC, the inclusion of the OHT into the FHP, intending to: institute a new work process focused on the family [16Oliveira JLC, Saliba NA. Dentistry attention in the Family’s Health Program (FHP) in Campos dos Goytacazes. Ciênc. Saúde Coletiva 2005; 10(Suppl. ): 297-302. [http://dx.doi.org/10.1590/S1413-81232005000500030] ], expand the population's access to promotion, prevention and recovery, and improve the epidemiological indicators of the population [14Farias MR, Sampaio JJC. Role of the dental surgeon in the family health team. RGO -. Rev Gaucha Odontol 2011; 59(1): 109-15., 19Baldani MH, Fadel CB, Possamai T, Queiroz MGS. Inclusion of oral health services in the Family Health Program in the State of Paraná, Brazil. Cad Saude Publica 2005; 21(4): 1026-35. [http://dx.doi.org/10.1590/S0102-311X2005000400005] ]. In this sense, the Moh created the Ordinance GM/MS No. 1,444, on December 28, 2000, which officially included oral health in the FHP, providing financial resources to encourage municipalities to adhere to the new model [4Brasil. Ministério da Saúde. Portaria n° 1.444, de 28 de dezembro de 2000. Estabelece o incentivo financeiro para a reorganização da atenção à saúde bucal prestada nos municípios por meio do Programa Saúde da Família. Brasília. Diário Oficial da União, 29 Dez, 2000.]. The rules and guidelines for this inclusion were regulated on March 6, 2001, through Ordinance GM/MS No. 267 [5Brasil. Ministério da Saúde. Portaria n°267, de 6 de março de 2001. Define as diretrizes e normas da inclusão das ações de saúde bucal no PSF. Brasília. Diário Oficial da União, 07 Mar, 2001.]. Thus, in the first quarter of 2001, the first OHT [20Soares FF, Figueiredo CRV, Borges NCM, Jordão RA, Freire MCM. Oral health teamwork in brazilian family healthcare strategy: an analysis of studies published between 2001 and 2008. Ciênc. Saúde Coletiva 2011; 16(7): 3169-80. [http://dx.doi.org/10.1590/S1413-81232011000800017] ] begin to be implanted, which could be inserted into two different modalities of habilitation: Mode I, which consisted of one dentist and one oral health assistant (OHA); and Mode II, which consisted of one dentist, one OHA and one oral health technician (OHTe). Initially, ordinance 1,444/2000 established the implementation of one OHT for each two FHP teams (an average of 6,900 patients to be attended by each OHT). Subsequently, Ordinance GM/MS 673, dated June 3, 2003, established that as many OHTs as the FHP teams in operation in the municipalities could be deployed [21Brasil. Ministério da Saúde. Portaria n° 673, de 03 de junho de 2003. Atualiza e revê o incentivo financeiro às Ações de Saúde Bucal: portaria de normas e diretrizes da saúde bucal. Brasília. Diário Oficial da União, 04 Jun, 2003., 22Rodrigues AAAO, Bonfim LS. Oral health in the family health program of a municipality of the semi-arid region of bahia (feira de santana): Organization and micropolitics. Rev APS 2010; 13(1): 96-108.]. The financial incentive to implement the OHT and to assist in the monthly costing of these teams was transferred to the municipalities through the variable Basic Attention Floor (BAF) [2Brasil. Ministério da Saúde. Portaria n° 648, de 28 de março de 2006. Aprova a Política Nacional de Atenção Básica, estabelecendo a revisão de diretrizes e normas para a organização da Atenção Básica para o Programa Saúde da Família (PSF) e o Programa Agentes comunitários de Saúde (PACS). Brasília. Diário Oficial da União, 29 Mar, 2006. ], and they had a gradual and considerable increase over the years (Table 2). Ordinances for the implantation and annual costing and their corresponding values. Source: Own elaboration from the Ordinances GM/MS No. 1,444 [4Brasil. Ministério da Saúde. Portaria n° 1.444, de 28 de dezembro de 2000. Estabelece o incentivo financeiro para a reorganização da atenção à saúde bucal prestada nos municípios por meio do Programa Saúde da Família. Brasília. Diário Oficial da União, 29 Dez, 2000. ], GM/MS No. 673 [22Rodrigues AAAO, Bonfim LS. Oral health in the family health program of a municipality of the semi-arid region of bahia (feira de santana): Organization and micropolitics. Rev APS 2010; 13(1): 96-108. ], GM/MS No. 74 [23 Brasil. Ministério da Saúde. Portaria n° 74, de 20 de janeiro de 2004. Reajusta os valores dos incentivos financeiros às Ações de Saúde Bucal: Portaria de normas e diretrizes da saúde bucal. Brasília. Diário Oficial da União, 21 Jan, 2004. .], GM/MS No. 650 [24 Brasil. Ministério da Saúde. Portaria n°650, de 28 de março de 2006. Define valores de financiamento do PAB fixo e variável mediante a revisão de diretrizes e normas para organização da Atenção Básica, para a estratégia de Saúde da Família e para o Programa de Agentes Comunitários de Saúde. Brasília. Diário Oficial da União, 29 Mar, 2006. ], GM/MS No. 2,489 [25 Brasil. Ministério da Saúde. Portaria n°2489, de 21 de outubro de 2008. Define valores de financiamento do Piso da Atenção Básica Variável para a Estratégia de Saúde da Família e de Saúde Bucal, instruídos pela Política Nacional de Atenção Básica. Brasília. Diário Oficial da União, 22 Out, 2008. ], GM/MS No. 3,066 [26Brasil. Ministério da Saúde. Portaria n°3066, de 23 de dezembro de 2008. Define Valores de Financiamento do Piso da Atenção Básica Variável para a Estratégia de Saúde da Família e de Saúde Bucal, instruídos pela Política Nacional de Atenção Básica. Brasília. Diário Oficial da União, 24 Dez, 2008. ], GM/MS No. 1,599 [27 Brasil. Ministério da Saúde. Portaria no 1.599, de 9 de julho de 2011 Define valores de financiamento do Piso da Atenção Básica Variável para as Equipes de Saúde da Família, Equipes de Saúde Bucal e aos Agentes Comunitários de Saúde, instituídos pela Política Nacional de Atenção Básica. Brasília. Diário Oficial da União, 11 Jul, 2011.] and GM/MS No. 978 [28 Brasil. Ministério da Saúde. Portaria n°978, de 16 de maio de 2012. Define valores de financiamento do Piso da Atenção Básica variável para as Equipes de Saúde da Família, Equipes de Saúde Bucal e aos Núcleos de Apoio à Saúde da Família, instituídos pela Política Nacional de Atenção Básica. Brasília. Diário Oficial da União, 17 Mai, 2012.]. In 2004, the guidelines of the National Oral Health Policy (PNSB) [29Brasil Ministério da Saúde Secretaria de Atenção à Saúde Departamento de Atenção Básica Coordenação Nacional de Saúde Bucal Diretrizes da Política Nacional de Saúde Bucal 2004.] were launched, which sought, among other things, to guide the reorganization of the oral health care model, and to guarantee the integral care of specialized actions through the creation of Dental Specialties Centers (DSC) and Regional Dental Prosthesis Laboratories (RDPL) [30Pucca-Junior GA, Costa JFR, Chagas LD, Sivestre RM. Oral health policies in Brazil. Braz Oral Res 2009; 23(Suppl. 1): 9-16. [http://dx.doi.org/10.1590/S1806-83242009000500003] ]. The PNSB represented a significant increase in the federal government's investment in oral health, from R$ 58 million in 2002 to R$ 1.3 billion in 2006 [31Maia LS, Kornis EMA. Reorganization of oral health care after federal incentives: Rio de Janeiro experience. Rev APS 2010; 13(1): 84-95.]. In 2006, the document “The Pact for Health” changed the way in which the SUS funding occurring, linking them into five large blocks. The resources for PNSB were contemplated in three of these blocks: APS (resources destined to oral health care in the FHS, within the variable BFA); UHS Management (costing of actions that increase access to the service, such as the implementation of DSCs); and Medium- and High-Care Complexities (a resource designed to provide a permanent incentive for the maintenance of DSCs and the payment of prosthetics performed by the RDPL). The health pact also redefined the responsibilities of each manager according to the health needs of the population, in the pursuit of social equity [2Brasil. Ministério da Saúde. Portaria n° 648, de 28 de março de 2006. Aprova a Política Nacional de Atenção Básica, estabelecendo a revisão de diretrizes e normas para a organização da Atenção Básica para o Programa Saúde da Família (PSF) e o Programa Agentes comunitários de Saúde (PACS). Brasília. Diário Oficial da União, 29 Mar, 2006.]. In 2009, MoH, through Ordinance No. 2,372, stipulated the provision of new dental equipment for OHTs, considering encouraging the reorganization of oral health care, expanding the population's access to OH promotion, prevention and recovery actions, and improving the epidemiological indices [32Brasil. Ministério da Saúde. Portaria n°.2372, de 7 de outubro de 2009. Cria o plano de fornecimento de equipamentos odontológicos para as Equipes de Saúde Bucal na Estratégia Saúde da Família. Brasília. Diário Oficial da União, 08 Out, 2009.]. For Pucca-Junior et al. [33Pucca-junior GA, Lucena EHG, Cawahisa PT. Financing national policy on oral health in Brazil in the context of the Unified Contextualization of the National Oral Health Policy. Braz Oral Res 2010; 24(Spec Iss 1): 26-32. ], this determination also aimed at improving the working conditions of dentist and making oral health actions more efficient. Importantly, the federal financial incentive does not, and did not, intend to be sufficient to maintain the costs related to OH [31Maia LS, Kornis EMA. Reorganization of oral health care after federal incentives: Rio de Janeiro experience. Rev APS 2010; 13(1): 84-95. ], with states and municipalities being responsible for the financial supplementation for the additional expenses related to the maintenance of equipment, the purchase of instruments, inputs and specific consumables [34Kornis GEM, Maia LS, Fortuna RFP. Dental care financing evolution in the SUS: analysis of the process of health care reorganization in relation to federal incentives. Physis 2011; 21(1): 197-215. [http://dx.doi.org/10.1590/S0103-73312011000100012] , 35Macêdo MS, Chaves SC, Fernandes AL. Investments and costs of oral health care for Family Health Care. Rev Saude Publica 2016; •••: 50. ], and the payment of professionals. The inclusion of OHT in the FHS was an opportunity to replace the exclusive models of attention to OH [33Pucca-junior GA, Lucena EHG, Cawahisa PT. Financing national policy on oral health in Brazil in the context of the Unified Contextualization of the National Oral Health Policy. Braz Oral Res 2010; 24(Spec Iss 1): 26-32.] and improve the quality of life of the population [36Navarro MFL, Modena KCS, Bresciani E. Social disparity and oral health. Braz 0ral Res 2012; 26(spe1): 17-24. [http://dx.doi.org/10.1590/S1806-83242012000700004] ]. It's actions aimed at the expansion and optimization of dental services, through the knowledge of the needs of the community where each OHT was inserted [37Barbosa AAA, Brito EWG, Costa ICC. Oral health care in the family health program, from its implementation to today’s moment: Perceptions of dentists and assistants in municipality context. Ciênc Odontol Bras 2007; 10(3): 53-60.]. The dentist, “in order to work in the FHS, needs to develop skills beyond its 'knowledge core', leaving the isolation of practice restricted to the dental office and equipment, assuming a new role in the team and actions to promote health” [38Reis WG, Scherer MDA, Carcereri DL. The work of the dental surgeon in Primary Health Care: Between the prescribed and the real. Saúde Debate 2015; 39(104): 56-64. [http://dx.doi.org/10.1590/0103-110420151040608] ]. The increase in the contribution of OH investment in Brazil in recent years has represented an expansion of coverage of dental services and equity of access to these services [39Fernandes JKB, Pinho JRO, Queiroz RCS, Thomaz EBAF. Evaluation of oral health indicators in Brazil: A trend towards equity in dental care? Cad Saude Publica 2016; 32(2): e00021115.]. However, analyzing if there are changes in the work process of the dentist [40Faccin D, Sebold R, Carcereri DL. Work process in oral health: Seeking different looks to understand and transform the reality. Ciênc. Saúde Coletiva 2010; 15(1): 1643-52. [http://dx.doi.org/10.1590/S1413-81232010000700076] , 41Brunhauser AL, Magro ML, Neves M. Evaluation of oral health services: A comparative study. RFO 2013; 18(1): 24-31.] is necessary, in order to contemplate the UHS principles. In this sense, some studies have shown that the OHT inserted in the FHS still maintains the predominance of the characteristics of the traditional care models [15Santiago WK, Werneck MAF, Ferreira EDE. The process of implementing dental care with in the family health care program in Belo Horizonte/MG: A qualitative study based on the perception of the oral health care coordination team and dental surgeons from the family health care program. Arquivos em Odontologia 2009; 45(4): 211-9., 20Soares FF, Figueiredo CRV, Borges NCM, Jordão RA, Freire MCM. Oral health teamwork in brazilian family healthcare strategy: an analysis of studies published between 2001 and 2008. Ciênc. Saúde Coletiva 2011; 16(7): 3169-80. [http://dx.doi.org/10.1590/S1413-81232011000800017] , 37Barbosa AAA, Brito EWG, Costa ICC. Oral health care in the family health program, from its implementation to today’s moment: Perceptions of dentists and assistants in municipality context. Ciênc Odontol Bras 2007; 10(3): 53-60., 40Faccin D, Sebold R, Carcereri DL. Work process in oral health: Seeking different looks to understand and transform the reality. Ciênc. Saúde Coletiva 2010; 15(1): 1643-52. [http://dx.doi.org/10.1590/S1413-81232010000700076] , 42Aquilante AG, Aciole GG. Oral health care after the national policy on oral health - "Smiling Brazil": A case study. Ciênc saúde coletiva 2015 Jan; 20(1): 239-48.-45Pires FS, Botazzo C, Pires FS, Botazzo C. Technological organization in oral health in SUS: An archeology of national policy for oral health. Saude Soc 2015; 24(1): 273-84. [http://dx.doi.org/10.1590/S0104-12902015000100021] ], which indicates that all the financial incentive seems not to be enough to lead to the necessary changes in professional practice. The maintenance of the work process is contrary to the operational characteristic of reorganization of OH's actions [5Brasil. Ministério da Saúde. Portaria n°267, de 6 de março de 2001. Define as diretrizes e normas da inclusão das ações de saúde bucal no PSF. Brasília. Diário Oficial da União, 07 Mar, 2001.]. The guidelines of the PNSB propose an adaptation of the work process to the new care model, and require, among other things, that the OHT not only works in the dental-technical field, but that it can interact with professionals from other areas, in order to expand their knowledge and allow the approach of the individual as a whole [29Brasil Ministério da Saúde Secretaria de Atenção à Saúde Departamento de Atenção Básica Coordenação Nacional de Saúde Bucal Diretrizes da Política Nacional de Saúde Bucal 2004.]. In interdisciplinarity, the sharing of knowledge and the complementarity of knowledge is essential to address health problems and risk factors of the population [9Costa RM, Medeiros-Júnior A, Costa ICC, Pinheiro IVA. Working process of dentist in the family health strategy of parnamirim-RN: Facing the challenges of a new care model. Rev Odontol Bras Central 2010; 19(51): 327-32., 18Cruz DB, Nascimento AC, Moysés SJ, Ditterick RG, Gabardo MCL. Working process in the family health strategy: a perspective from the oral health team. Rev APS 2009; 12(2): 168-75. ], produce more effective care for the patient [14Farias MR, Sampaio JJC. Role of the dental surgeon in the family health team. RGO -. Rev Gaucha Odontol 2011; 59(1): 109-15. ], and approach the patient integrally [3Lourenço EC, Silva ACB, Meneghin MC, Pereira AC. The insertion of oral health services in the Family Health Program at Minas Gerais State, Brazil. Ciênc. Saúde Coletiva 2009; 14(Suppl. 1): 1367-77.]. Thus, acting in the UHS requires the professional to be able to “think no more about a subject-individual, but about a collective-subject” [46Farias MR, Sampaio JJC. Integrating oral health team at the family health strategy: The professionals perception Rev baiana saúde pública 2011; 34(4): 745-57.]. However, some results have shown a challenge regarding the performance of OHT in an interdisciplinary way with the rest of the team [3Lourenço EC, Silva ACB, Meneghin MC, Pereira AC. The insertion of oral health services in the Family Health Program at Minas Gerais State, Brazil. Ciênc. Saúde Coletiva 2009; 14(Suppl. 1): 1367-77., 6Moraes LB, Kligerman DC, Cohen SC. Analysis on the socio-demographic profile and dental surgeon’s work process in the Family Health Program, in three cities of the mountain region of the state of Rio de Janeiro. Physis 2015; 25(1): 171-86. [http://dx.doi.org/10.1590/S0103-73312015000100010] -9Costa RM, Medeiros-Júnior A, Costa ICC, Pinheiro IVA. Working process of dentist in the family health strategy of parnamirim-RN: Facing the challenges of a new care model. Rev Odontol Bras Central 2010; 19(51): 327-32., 15Santiago WK, Werneck MAF, Ferreira EDE. The process of implementing dental care with in the family health care program in Belo Horizonte/MG: A qualitative study based on the perception of the oral health care coordination team and dental surgeons from the family health care program. Arquivos em Odontologia 2009; 45(4): 211-9., 46Farias MR, Sampaio JJC. Integrating oral health team at the family health strategy: The professionals perception Rev baiana saúde pública 2011; 34(4): 745-57.-49Scherer CI, Scherer MDA. Advances and challenges in oral health after a decade of the “Smiling Brazil” Program. Rev Saude Publica 2015; 49: 98. [http://dx.doi.org/10.1590/S0034-8910.2015049005961] ], which may be justified by the fact that dentistry was later incorporated into the FHS [3Lourenço EC, Silva ACB, Meneghin MC, Pereira AC. The insertion of oral health services in the Family Health Program at Minas Gerais State, Brazil. Ciênc. Saúde Coletiva 2009; 14(Suppl. 1): 1367-77., 19Baldani MH, Fadel CB, Possamai T, Queiroz MGS. Inclusion of oral health services in the Family Health Program in the State of Paraná, Brazil. Cad Saude Publica 2005; 21(4): 1026-35. [http://dx.doi.org/10.1590/S0102-311X2005000400005] , 50Cericato GO, Garbin D, Fernandes APS. Surgeon-dentist insertion in the Family Health Program: A critical revision on the actions and evaluation methods of the Oral Health Team. RFO 2007; 12(3): 18-23.] and/or by the characteristics of vocational training [3Lourenço EC, Silva ACB, Meneghin MC, Pereira AC. The insertion of oral health services in the Family Health Program at Minas Gerais State, Brazil. Ciênc. Saúde Coletiva 2009; 14(Suppl. 1): 1367-77.]. For the dentist that works in the FHS, as important as the technical skill is the knowledge in the collective oral health area and the development of the citizen conscience [18Cruz DB, Nascimento AC, Moysés SJ, Ditterick RG, Gabardo MCL. Working process in the family health strategy: a perspective from the oral health team. Rev APS 2009; 12(2): 168-75. ], both still poorly contemplated in the dentistry graduate courses, which in large part still form a professional focused on the biomedical paradigm and with a predominantly procedure-centered approach [14Farias MR, Sampaio JJC. Role of the dental surgeon in the family health team. RGO -. Rev Gaucha Odontol 2011; 59(1): 109-15., 51Rodrigues AAAO, Fonsêca GS, Siqueira DVS, Assis MMA, Nascimento MAA. Oral health team practices within the family health strategy and construction (de) construction of integrality in Feira de Santana-BA. Rev APS 2010; 13(4): 476-85.]. The National Curricular Guidelines of the Dentistry Graduate Course of 2002 include among its objectives: to train professionals who respect the ethical principles inherent to professional practice, who are committed to the human being, who exercise their profession in an articulated way to the social context, and who have the necessary knowledge to act at all levels of health care: promotion, prevention, maintenance, protection and recovery of health [52Brasil. Conselho Nacional de Educação. Câmara de Educação Superior Diretrizes curriculares nacionais do curso de Graduação em Odontologia. Brasília, Diário Oficial da União, 04 Mar, 2002.]. In order to repair possible failures in the dentist formation and to adapt it to the new care model, public policies that incorporate training programs are necessary to enable the dentist to act in accordance with the guidelines of the FHS [6Moraes LB, Kligerman DC, Cohen SC. Analysis on the socio-demographic profile and dental surgeon’s work process in the Family Health Program, in three cities of the mountain region of the state of Rio de Janeiro. Physis 2015; 25(1): 171-86. [http://dx.doi.org/10.1590/S0103-73312015000100010] , 38Reis WG, Scherer MDA, Carcereri DL. The work of the dental surgeon in Primary Health Care: Between the prescribed and the real. Saúde Debate 2015; 39(104): 56-64. [http://dx.doi.org/10.1590/0103-110420151040608] , 51Rodrigues AAAO, Fonsêca GS, Siqueira DVS, Assis MMA, Nascimento MAA. Oral health team practices within the family health strategy and construction (de) construction of integrality in Feira de Santana-BA. Rev APS 2010; 13(4): 476-85., 53Silveira Filho AD, Moysés SJ, Kusma SZ, Moysés ST. Potential effectiveness of strategies to promote oral health in primary health care: Comparative study among Brazilian capitals and regions. Rev Bras Epidemiol 2016; 19(4): 851-65. [http://dx.doi.org/10.1590/1980-5497201600040014] ], since nothing can guarantee “that there will be changes in the current care model if the professionals do not change the way they produce care” [9Costa RM, Medeiros-Júnior A, Costa ICC, Pinheiro IVA. Working process of dentist in the family health strategy of parnamirim-RN: Facing the challenges of a new care model. Rev Odontol Bras Central 2010; 19(51): 327-32.]. Under the responsibility of the health departments of the municipalities and states [2Brasil. Ministério da Saúde. Portaria n° 648, de 28 de março de 2006. Aprova a Política Nacional de Atenção Básica, estabelecendo a revisão de diretrizes e normas para a organização da Atenção Básica para o Programa Saúde da Família (PSF) e o Programa Agentes comunitários de Saúde (PACS). Brasília. Diário Oficial da União, 29 Mar, 2006., 5Brasil. Ministério da Saúde. Portaria n°267, de 6 de março de 2001. Define as diretrizes e normas da inclusão das ações de saúde bucal no PSF. Brasília. Diário Oficial da União, 07 Mar, 2001. ], the training facilitates the understanding of the professionals about the objectives of the program. Some municipalities performed this training [19Baldani MH, Fadel CB, Possamai T, Queiroz MGS. Inclusion of oral health services in the Family Health Program in the State of Paraná, Brazil. Cad Saude Publica 2005; 21(4): 1026-35. [http://dx.doi.org/10.1590/S0102-311X2005000400005] , 22Rodrigues AAAO, Bonfim LS. Oral health in the family health program of a municipality of the semi-arid region of bahia (feira de santana): Organization and micropolitics. Rev APS 2010; 13(1): 96-108. ], however, most of the published studies report that dentist are being inserted into the FHS without training [3Lourenço EC, Silva ACB, Meneghin MC, Pereira AC. The insertion of oral health services in the Family Health Program at Minas Gerais State, Brazil. Ciênc. Saúde Coletiva 2009; 14(Suppl. 1): 1367-77., 18Cruz DB, Nascimento AC, Moysés SJ, Ditterick RG, Gabardo MCL. Working process in the family health strategy: a perspective from the oral health team. Rev APS 2009; 12(2): 168-75., 38Reis WG, Scherer MDA, Carcereri DL. The work of the dental surgeon in Primary Health Care: Between the prescribed and the real. Saúde Debate 2015; 39(104): 56-64. [http://dx.doi.org/10.1590/0103-110420151040608] , 40Faccin D, Sebold R, Carcereri DL. Work process in oral health: Seeking different looks to understand and transform the reality. Ciênc. Saúde Coletiva 2010; 15(1): 1643-52. [http://dx.doi.org/10.1590/S1413-81232010000700076] , 48Chaves MC, Miranda AS. Discourse among dentists within the family healthcare program: Crisis and change of habitus within public health. Interface(Botucatu) 2008; 12(24): 153-67. ], which may be causing the reproduction of the traditional curative model. In this change of the work process, preventive-educational actions are important, since it has low complexity and high population coverage [22Rodrigues AAAO, Bonfim LS. Oral health in the family health program of a municipality of the semi-arid region of bahia (feira de santana): Organization and micropolitics. Rev APS 2010; 13(1): 96-108.]. They must be carried out in a rational and reasonable manner, with evaluations to verify their effectiveness [8Souza TMS, Roncalli AG. Oral health in the Brazilian Family Health Program: A health care model evaluation. Cad Saude Publica 2007; 23(11): 2727-39. [http://dx.doi.org/10.1590/S0102-311X2007001100020] ]. Aquilante and Aciole [42Aquilante AG, Aciole GG. Oral health care after the national policy on oral health - "Smiling Brazil": A case study. Ciênc saúde coletiva 2015 Jan; 20(1): 239-48.] reported, in their study, the periodic practice of educational groups, organized by life cycles, which is in line with the guidelines of the PNSB, which states that these actions should be offered in a continuous way and to different priority groups [29Brasil Ministério da Saúde Secretaria de Atenção à Saúde Departamento de Atenção Básica Coordenação Nacional de Saúde Bucal Diretrizes da Política Nacional de Saúde Bucal 2004.]. Nevertheless, studies have reported that schools and day-care centers have been places of choice for these actions [3Lourenço EC, Silva ACB, Meneghin MC, Pereira AC. The insertion of oral health services in the Family Health Program at Minas Gerais State, Brazil. Ciênc. Saúde Coletiva 2009; 14(Suppl. 1): 1367-77., 8Souza TMS, Roncalli AG. Oral health in the Brazilian Family Health Program: A health care model evaluation. Cad Saude Publica 2007; 23(11): 2727-39. [http://dx.doi.org/10.1590/S0102-311X2007001100020] , 40Faccin D, Sebold R, Carcereri DL. Work process in oral health: Seeking different looks to understand and transform the reality. Ciênc. Saúde Coletiva 2010; 15(1): 1643-52. [http://dx.doi.org/10.1590/S1413-81232010000700076] ], which can be seen as a remnant of the practices of traditional models of oral health [42Aquilante AG, Aciole GG. Oral health care after the national policy on oral health - "Smiling Brazil": A case study. Ciênc saúde coletiva 2015 Jan; 20(1): 239-48.]. In addition, a recent study has shown that there is still a low number of OH teams who perform preventive dental procedures, such as dental sealant, topical application of fluoride, among others [54Neves M, Giordani JM, Ferla AA, Hugo FN. Primary care dentistry in Brazil: From prevention to comprehensive care. J Ambul Care Manage. 2017 Apr/Jun;40 Suppl 2 Supplement, The Brazilian National Program for Improving Primary Care Access and Quality (PMAQ):S35-S48.]. Knowing the reality of the area of operation is essential to plan a service in an equitable and ethical way. The realization, together with the other members of the team, of the territorialization and the planning of health actions, are also part of the attributions of the dentist [2Brasil. Ministério da Saúde. Portaria n° 648, de 28 de março de 2006. Aprova a Política Nacional de Atenção Básica, estabelecendo a revisão de diretrizes e normas para a organização da Atenção Básica para o Programa Saúde da Família (PSF) e o Programa Agentes comunitários de Saúde (PACS). Brasília. Diário Oficial da União, 29 Mar, 2006.]. Knowing the epidemiological profile and the socioeconomic characteristics of the community are essential, in order to develop priority promotion, protection and recovery actions [29Brasil Ministério da Saúde Secretaria de Atenção à Saúde Departamento de Atenção Básica Coordenação Nacional de Saúde Bucal Diretrizes da Política Nacional de Saúde Bucal 2004. ], seeking to reorganize oral health care in PHC with a view to the UHS guidelines [47Nascimento AC, Moysés ST, Werneck RI, Moysés SJ. Oral health in the context of primary care in Brazil. Int Dent J 2013; 63(5): 237-43.]. Although there is a study that reports this fact [37Barbosa AAA, Brito EWG, Costa ICC. Oral health care in the family health program, from its implementation to today’s moment: Perceptions of dentists and assistants in municipality context. Ciênc Odontol Bras 2007; 10(3): 53-60. ], attention has been drawn to the lack of accomplishment of the situational diagnosis of the area of performance [9Costa RM, Medeiros-Júnior A, Costa ICC, Pinheiro IVA. Working process of dentist in the family health strategy of parnamirim-RN: Facing the challenges of a new care model. Rev Odontol Bras Central 2010; 19(51): 327-32., 20Soares FF, Figueiredo CRV, Borges NCM, Jordão RA, Freire MCM. Oral health teamwork in brazilian family healthcare strategy: an analysis of studies published between 2001 and 2008. Ciênc. Saúde Coletiva 2011; 16(7): 3169-80. [http://dx.doi.org/10.1590/S1413-81232011000800017] ]. The realization of the agenda should be widely discussed with the community in local and municipal health councils [55Brasil Ministério da Saúde Saúde Bucal - Cadernos de Atenção Básica 17 2006.] because the population's knowledge on their needs and the limitations of the System favors the development of policies appropriate to the epidemiological profile of the community [56Junqueira SR, Pannuti CM, Rode SM. Oral health in Brazil – Part I : Public oral health policies. Braz Oral Res 2008; 22(Spec Iss 1): 8-17.]. A study carried out by Cruz et al. [18Cruz DB, Nascimento AC, Moysés SJ, Ditterick RG, Gabardo MCL. Working process in the family health strategy: a perspective from the oral health team. Rev APS 2009; 12(2): 168-75.] on the work process of the OHT in the city of Curitiba identified an important participation of the dentist in the Local Health Councils. On the other hand, the study by Moraes et al. [6Moraes LB, Kligerman DC, Cohen SC. Analysis on the socio-demographic profile and dental surgeon’s work process in the Family Health Program, in three cities of the mountain region of the state of Rio de Janeiro. Physis 2015; 25(1): 171-86. 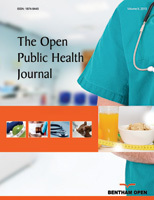 [http://dx.doi.org/10.1590/S0103-73312015000100010] ] showed little involvement of the oral health (OH) professionals with the living conditions of the community. The work carried out by the dentist outside the health unit is essential to know the social reality of the population and for professionals to strengthen the bonds formed with the community [9Costa RM, Medeiros-Júnior A, Costa ICC, Pinheiro IVA. Working process of dentist in the family health strategy of parnamirim-RN: Facing the challenges of a new care model. Rev Odontol Bras Central 2010; 19(51): 327-32.]. The home visit (HV), in particular, increases OHT's bond with the family and is a way to bring access to oral health services to people with limited mobility [6Moraes LB, Kligerman DC, Cohen SC. Analysis on the socio-demographic profile and dental surgeon’s work process in the Family Health Program, in three cities of the mountain region of the state of Rio de Janeiro. Physis 2015; 25(1): 171-86. [http://dx.doi.org/10.1590/S0103-73312015000100010] ]. Unfortunately, studies report the non-implementation of this practice by the OHT [6Moraes LB, Kligerman DC, Cohen SC. Analysis on the socio-demographic profile and dental surgeon’s work process in the Family Health Program, in three cities of the mountain region of the state of Rio de Janeiro. Physis 2015; 25(1): 171-86. [http://dx.doi.org/10.1590/S0103-73312015000100010] , 43Rodrigues AAAO, Assis MMA, Nascimento MAA, Fonsêca GS, Siqueira DVS. Oral health in family health strategy in a town of the bahian semiarid. Rev baiana saúde pública 2011; 35(3): 695-709.]. Ordinance 267/2001 already had as a common attribution to all of the FHS the performance of the HV, according to the identified needs [5Brasil. Ministério da Saúde. Portaria n°267, de 6 de março de 2001. Define as diretrizes e normas da inclusão das ações de saúde bucal no PSF. Brasília. Diário Oficial da União, 07 Mar, 2001.] and the PNSB/2004 guidelines reaffirmed the importance of this practice, mentioning it as an opportunity to identify oral lesions for the early detection of oral cancer [29Brasil Ministério da Saúde Secretaria de Atenção à Saúde Departamento de Atenção Básica Coordenação Nacional de Saúde Bucal Diretrizes da Política Nacional de Saúde Bucal 2004.]. However, a study with Brazilian dental surgeons identified the low adherence of these professionals to the actions related to oral cancer screening [57Reis CMR, Matta-Machado ATG, Amaral JHL, Werneck MAF, Abreu MHNG. Describing the primary care actions of oral health teams in Brazil. Int J Environ Res Public Health 2015; 12(1): 667-78. [http://dx.doi.org/10.3390/ijerph120100667] ]. Another important point for the transformation of the OH care model, reported in some studies, is the qualification of the Community Health Agents (CHA) to be multipliers of oral health information [37Barbosa AAA, Brito EWG, Costa ICC. Oral health care in the family health program, from its implementation to today’s moment: Perceptions of dentists and assistants in municipality context. Ciênc Odontol Bras 2007; 10(3): 53-60., 58Cunha BAT, Marques RAA, Castro CGJ, Narvai PC. Oral health in Diadema, Brazil: From schoolchildren dentistry to family health strategy. Saude Soc 2011; 20(4): 1033-45. [http://dx.doi.org/10.1590/S0104-12902011000400019] ], and, in fact, ordinance 267 of 2001 brought as one of the specific duties of the dental surgeon the qualification of all the team on oral health [5Brasil. Ministério da Saúde. Portaria n°267, de 6 de março de 2001. Define as diretrizes e normas da inclusão das ações de saúde bucal no PSF. Brasília. Diário Oficial da União, 07 Mar, 2001.]. Reis et al. [38Reis WG, Scherer MDA, Carcereri DL. The work of the dental surgeon in Primary Health Care: Between the prescribed and the real. Saúde Debate 2015; 39(104): 56-64. [http://dx.doi.org/10.1590/0103-110420151040608] ] draw attention to the need for a combination of autonomy and responsibility in the working process of the dentist so that its actions are resolute. They consider that the presence of norms is essential; however, they also state that the singularity of the work practice of each professional in their reality is fundamental. They emphasize that freedom at work favors creativity, but it relates to the commitment and the affinity of the professional with its work [38Reis WG, Scherer MDA, Carcereri DL. The work of the dental surgeon in Primary Health Care: Between the prescribed and the real. Saúde Debate 2015; 39(104): 56-64. [http://dx.doi.org/10.1590/0103-110420151040608] ]. Finally, Cruz et al. [18Cruz DB, Nascimento AC, Moysés SJ, Ditterick RG, Gabardo MCL. Working process in the family health strategy: a perspective from the oral health team. Rev APS 2009; 12(2): 168-75.] reported in their study that “there seems to be a reasonable understanding about the focus of actions being directed to the family nucleus and not to the individual alone”, which corroborates one of the bases for the reorganization of oral health, which is the definition of the family as the central nucleus of approach [5Brasil. Ministério da Saúde. Portaria n°267, de 6 de março de 2001. Define as diretrizes e normas da inclusão das ações de saúde bucal no PSF. Brasília. Diário Oficial da União, 07 Mar, 2001.]. Since the official insertion of the OHT into the FHS, the number of teams incorporated into the OHT has been increasing, from 2,248 in 2001 to 24,467 teams in 2015, in both modalities. These teams were distributed in 1,288 municipalities in 2001, increasing to 5,014 municipalities (90% of Brazilian municipalities) in 2015 [10 Brasil. Ministério da Saúde. Departamento de Atenção Básica. Histórico de cobertura Saúde da Família. Disponível em: http:// dab.saude.gov.br/ portaldab/ historico_cobertura_sf.php Acesso em: 17 nov. 2016.]. This increase in the number of OHT implanted facilitated the population's access to oral health services, leading the percentage of Brazilians who had never had access to dental consultations to decline from 18.7% in 1998 to 15.9% in 2003, and, later, to 11.7% in 2008 [59 Brasil. Ministério da Saúde. Departamento de Informática do SUS. Indicadores de cobertura. Disponível em: http:// tabnet.datasus.gov.br/ cgi/ dh.exe?idb2012/f2102.def >.Acesso Acesso em:20 nov. 2016.]. The increase in the number of dentists registered in the UHS led to an increase in the number of first dental consultations (indicator used to assess access to oral health services), which increased from approximately 21.5 million in 2001 to almost 30 million in 2015 [11 Brasil. Ministério da Saúde. Sistema de Informações Ambulatoriais do SUS (SIA-SUS). Disponível em: http:/ /www2.datasus.gov.br/ DATASUS/ index.php?area=0202& id=19122&VObj=http://tabnet.datasus.gov.br/cgi/deftohtm.exe?sia/cnv/qa Acesso em: 17 nov. 2016. ]. Corrêa and Celeste [60Corrêa GT, Celeste RK. Association between coverage by oral health teams in the family health and the increase in dental care output in Brazilian municipalities, 1999 and 2011. Cad Saude Publica 2015; 31(12): 2588-98.] analyzed the association between OHT coverage in the FHS and increased outpatient production in Brazilian municipalities between 1999 and 2011, and reported that the average rate of procedures increased 49.5% in 2011 in relation to 1999, which shows that this incorporation is associated with greater chances of increasing rates of use of dental services, and associates this increase with meeting the repressed demand and the 40-hour weekly load of the OHT. Analyzing data from the UHS Outpatient Information System on the use of oral health services in the period between 2001 and 2015, the rate of preventive procedures increased 35% (from 10.95/thousand in 2001 to 14.77/ thousand inhabitants in 2015); the rate of restorations increased 15.5% (from 16.17/thousand inhabitants in 2001 to 18.67/thousand inhabitants in 2015); and the rate of exodontias decreased 10.1% (from 9.20/thousand inhabitants in 2011 to 8.18/thousand inhabitants in 2015) [11 Brasil. Ministério da Saúde. Sistema de Informações Ambulatoriais do SUS (SIA-SUS). Disponível em: http:/ /www2.datasus.gov.br/ DATASUS/ index.php?area=0202& id=19122&VObj=http://tabnet.datasus.gov.br/cgi/deftohtm.exe?sia/cnv/qa Acesso em: 17 nov. 2016. ]. Regarding the exodontia, a study carried out in the states of the Brazilian southern region, between 2000 and 2005, already showed a downward trend in the ratio between the number of permanent tooth exodontia and the number of individual dental procedures in the PHC. Rio Grande do Sul had the highest rate of decline in this indicator, from 14.06 in 2000 to 8.49 in 2005 [61Fischer TK, Peres KG, Kupek E, Peres MA. Primary dental care indicators: Association with socioeconomic status, dental care, water fluoridation and Family Health Program in Southern Brazil. Rev Bras Epidemiol 2010; 13(1): 126-38. [http://dx.doi.org/10.1590/S1415-790X2010000100012] ]. Studies performed in some Brazilian municipalities to analyze the evolution of the indicators after the insertion of the OHT into the FHS showed that, with the increase in the average number of OHT over the years, the indicators of access [62Palacio DC, Vazquez FL, Ramos DVR, et al. Evolution of post-deployment indicators of oral health on the family health strategy. Einstein (Sao Paulo) 2014; 12(3): 274-81. [http://dx.doi.org/10.1590/s1679-45082014ao3000] -64Nascimento AC, Moysés ST, Bisinelli JC, Moysés SJ. Oral health in the family health strategy: A change of practices or semantics diversionism. Rev Saude Publica 2009; 43(3): 455-62. [http://dx.doi.org/10.1590/S0034-89102009000300009] ], income, and the percentage of urgencies also increased, and the number of supervised brushings increased considerably [62Palacio DC, Vazquez FL, Ramos DVR, et al. Evolution of post-deployment indicators of oral health on the family health strategy. Einstein (Sao Paulo) 2014; 12(3): 274-81. [http://dx.doi.org/10.1590/s1679-45082014ao3000] ]. The increase in population coverage by OHT was also related to the reduction of periodontal problems in the elderly [63Dalazen CE, De Carli AD, Bomfim RA, Dos Santos ML. Contextual and individual factors influencing periodontal treatment needs by elderly Brazilians: A Multilevel Analysis. PLoS One 2016; 11(6): e0156231. [http://dx.doi.org/10.1371/journal.pone.0156231] ]. However, there are studies that have identified inequalities in this access [65Baldani MA, Antunes JLF. Inequalities in access and utilization of dental services: A cross-sectional study in an area covered by the family health strategy. Cad Saude Publica 2011; 27(Suppl. 2): s272-83. [http://dx.doi.org/10.1590/S0102-311X2011001400014] ]. The study by Carvalho et al [66Carvalho JC, Rebelo MAB, Vettore MV. Dental pain in the previous 3 months in adolescents and family health strategy: The comparison between two areas with different to oralhealth care approaches. Ciênc. Saúde Coletiva 2011; 16(10): 4107-14. [http://dx.doi.org/10.1590/S1413-81232011001100016] ] also found a positive result, showing that adolescents living in areas with OHT coverage in FHS were less prone to more severe tooth pain when compared to those living in areas with traditional dental treatment, and suggesting that early diagnosis and treatment of minor injuries may have reduced dental pain. Brunhauser et al. [41Brunhauser AL, Magro ML, Neves M. Evaluation of oral health services: A comparative study. RFO 2013; 18(1): 24-31.] reported in their study that access to dental consultation was considered easier by users of the FHS in relation to the users of traditional basic health units. However, with respect to satisfaction regarding the resolution of care, “users attended at the conventional BHU, proportionally, showed greater satisfaction with their reported masticatory capacity after receiving treatment”, compared to those attended at the FHS, which calls attention to the need to reflect if changes are actually occurring in the oral health care model. Pereira et al. [67Pereira CRS, Patrício AAR, Araújo FAC, Lucena EES, Lima KC, Roncalli AG. Inclusion of oral health teams in the family health program and its impact on the use of dental services. Cad Saude Publica 2009; 25(5): 985-96. [http://dx.doi.org/10.1590/S0102-311X2009000500005] ] conducted a study in Natal-RN, comparing areas with OHT in the FHS, areas covered by FHS units with a dentist without linking to the family health team, and areas covered by traditional or uncovered basic health units, and found that. The impact of oral health on FHS was only significant when compared to areas covered by traditional units or without any coverage, i.e., the access to dental service was not different, when compared to the FHS with OHT or with traditional oral health service. According to the author, this analysis would isolate the effect of the presence of the OHT in the FHS [67Pereira CRS, Patrício AAR, Araújo FAC, Lucena EES, Lima KC, Roncalli AG. Inclusion of oral health teams in the family health program and its impact on the use of dental services. Cad Saude Publica 2009; 25(5): 985-96. [http://dx.doi.org/10.1590/S0102-311X2009000500005] ]. A study carried out in Brazil between the periods of 1998 and 2012 showed that municipalities with higher OHT coverage have, on average, a higher rate of dental extraction [68Cunha MAGM, Lino PA, Santos TR, Vasconcelos M, Lucas SD, Abreu MHNG. 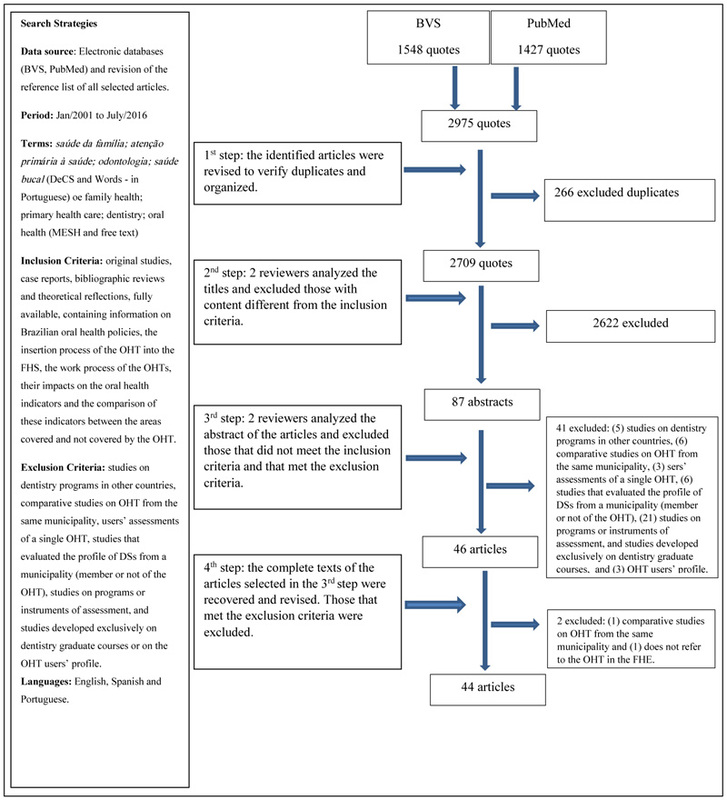 A 15-Year Time-series study of tooth extraction in Brazil. Medicine (Baltimore) 2015; 94(47): e1924. [http://dx.doi.org/10.1097/MD.0000000000001924] ]. A study in the south of the country comparing oral health of adolescents living in areas covered or not covered by the OHT in the FHS found similar result, which showed that there were no significant differences in the comparison of almost all oral health outcomes between the two areas compared, with the exception of dental floss, which showed that young people from areas not covered by the OHT in the FHS had almost half of the dental loss compared to adolescents in the covered areas [13Ely HC, Abegg C, Celeste RK, Pattussi MP. Impact of oral health teams of the Family Health Strategy on the oral health of adolescents in the south of Brazil. Ciênc. Saúde Coletiva 2016; 21(5): 1607-16. [http://dx.doi.org/10.1590/1413-81232015215.07822015] ]. The author pondered that these outcomes may have been caused by maintaining the traditional transgender work process of the OHT and that the greater amount of tooth loss in areas with the OHT may be justified by the increased access to these traditional mutilating practices. Research carried out in the Brazilian Northeast comparing the impact of oral health indicators in areas with implanted OHT, and areas with dental care of the traditional model or without care, demonstrated positive results in relation to access to collective preventive actions and the treatment of toothache; however, found a negative or no effect in relation to restorative treatment and exodontia, and suggested “a poor performance of the incorporation of oral health in FHS” [12Pereira CRS, Roncalli AG, Cangussu MCT, Noro LRA, Patrício AAR, Lima KC. Impact of the family health strategy: An analysis in cities in Northeast Brazil with more than 100,000 inhabitants. Cad Saude Publica 2012; 28(3): 449-62. [http://dx.doi.org/10.1590/S0102-311X2012000300005] ]. Few studies have been done to analyze the dentist inclusion into the OHT [67Pereira CRS, Patrício AAR, Araújo FAC, Lucena EES, Lima KC, Roncalli AG. Inclusion of oral health teams in the family health program and its impact on the use of dental services. Cad Saude Publica 2009; 25(5): 985-96. [http://dx.doi.org/10.1590/S0102-311X2009000500005] ], and to assess its impact on epidemiological indicators [12Pereira CRS, Roncalli AG, Cangussu MCT, Noro LRA, Patrício AAR, Lima KC. Impact of the family health strategy: An analysis in cities in Northeast Brazil with more than 100,000 inhabitants. Cad Saude Publica 2012; 28(3): 449-62. [http://dx.doi.org/10.1590/S0102-311X2012000300005] , 67Pereira CRS, Patrício AAR, Araújo FAC, Lucena EES, Lima KC, Roncalli AG. Inclusion of oral health teams in the family health program and its impact on the use of dental services. Cad Saude Publica 2009; 25(5): 985-96. [http://dx.doi.org/10.1590/S0102-311X2009000500005] , 69Pereira IF, Sales GLD, Cunha DA, et al. Evolution of the family health strategy oral health coverage in municipalities in Paraíba. Rev APS 2014; 17(1): 44-9.]. Ely et al. [13Ely HC, Abegg C, Celeste RK, Pattussi MP. Impact of oral health teams of the Family Health Strategy on the oral health of adolescents in the south of Brazil. Ciênc. Saúde Coletiva 2016; 21(5): 1607-16. [http://dx.doi.org/10.1590/1413-81232015215.07822015] ] add that there is little evidence of the beneficial impact of the OHT. This statement is in line with a study that points out that the incorporation of the OHT into the FHS is producing results that could be better, taking into account the size of the investment made in the program and the proposed change of the traditional model [12Pereira CRS, Roncalli AG, Cangussu MCT, Noro LRA, Patrício AAR, Lima KC. Impact of the family health strategy: An analysis in cities in Northeast Brazil with more than 100,000 inhabitants. Cad Saude Publica 2012; 28(3): 449-62. [http://dx.doi.org/10.1590/S0102-311X2012000300005] ]. In this sense, the way strategies are being implemented in each location is crucial to their success [12Pereira CRS, Roncalli AG, Cangussu MCT, Noro LRA, Patrício AAR, Lima KC. Impact of the family health strategy: An analysis in cities in Northeast Brazil with more than 100,000 inhabitants. Cad Saude Publica 2012; 28(3): 449-62. [http://dx.doi.org/10.1590/S0102-311X2012000300005] , 67Pereira CRS, Patrício AAR, Araújo FAC, Lucena EES, Lima KC, Roncalli AG. Inclusion of oral health teams in the family health program and its impact on the use of dental services. Cad Saude Publica 2009; 25(5): 985-96. [http://dx.doi.org/10.1590/S0102-311X2009000500005] ]. For Mattos et al. [7Mattos GCM, Ferreira EF, Leite ICG, Greco RM. The inclusion of the oral health team in the Brazilian Family Health Strategy: barriers, advances and challenges. Ciênc. Saúde Coletiva 2014; 19(2): 373-82. [http://dx.doi.org/10.1590/1413-81232014192.21652012] ], “the lack of training of managers certainly impacts considerably on the way the implementation of the new care model has been happening in the Brazilian municipalities”. The OHT were inserted in Niteroi-RJ, in 2010, and, in this municipality, the dentists participated in an introductory course to know the territory, population profile and methodology of the Family Medical Program (FMP) of the municipality, besides having a schedule set in the weekly agenda of dental health professionals for permanent education along with the other members of the FMP team. These professionals carry out activities with specific groups, home visits, interdisciplinary meetings and activities at schools, kindergartens and other community institutions [70Marin J, Machado MTC, Gouvêa MV, Mayernyik MA. From the integrity of a program to the necessary amalgam: The introduction of the oral health teams into the family health strategy in the city of Niteroi in the state of Rio de Janeiro. Rev APS 2014; 17(1): 32-9. ], corroborating the expectations of the new Oral Health model proposed by the federal government. With all the advances that occurred in the attention to OH in Brazil after its implantation in the FHS, there are still reports of factors that prevent its full success. Soares [71Soares CLM. Constructing public oral health policies in Brazil : Issues for reflection. Braz Oral Res 2012; 26(Spec Iss 1): 94-102.] described in his study that, although Brazilian OH policies have made significant progress regarding federal government participation and the constitution of norms, they still present challenges regarding the implementation process and the participation of state and municipal governments. Ordinance 648/2006 assigns the responsibility of the states to allocate resources to compose the tripartite funding of PHC, and the municipalities have the responsibility to “guarantee the necessary infrastructure for the operation of the Basic Health Units, providing them with material resources, equipment and sufficient inputs” [2Brasil. Ministério da Saúde. Portaria n° 648, de 28 de março de 2006. Aprova a Política Nacional de Atenção Básica, estabelecendo a revisão de diretrizes e normas para a organização da Atenção Básica para o Programa Saúde da Família (PSF) e o Programa Agentes comunitários de Saúde (PACS). Brasília. Diário Oficial da União, 29 Mar, 2006.]. It is clear, therefore, that although the federal government passes on an incentive for the implementation and maintenance of the OHT, it is not solely responsible for this. The FHS has as its foundations the development of relationships of bonding and accountability between the teams and the surrounding population, the guarantee of the continuity of health actions, and the longitudinality of care [2Brasil. Ministério da Saúde. Portaria n° 648, de 28 de março de 2006. Aprova a Política Nacional de Atenção Básica, estabelecendo a revisão de diretrizes e normas para a organização da Atenção Básica para o Programa Saúde da Família (PSF) e o Programa Agentes comunitários de Saúde (PACS). Brasília. Diário Oficial da União, 29 Mar, 2006., 72Motta LS, Siqueira-batista R. Family health strategy: Clinical and critical. Rev Bras Educ Med 2015; 39(2): 196-207. [http://dx.doi.org/10.1590/1981-52712015v39n2e00912014] ]. Therefore, the turnover of professionals, due to the precariousness of the employment relationship and the form of hiring to work in the OHT, found in some studies [3Lourenço EC, Silva ACB, Meneghin MC, Pereira AC. The insertion of oral health services in the Family Health Program at Minas Gerais State, Brazil. Ciênc. Saúde Coletiva 2009; 14(Suppl. 1): 1367-77., 7Mattos GCM, Ferreira EF, Leite ICG, Greco RM. The inclusion of the oral health team in the Brazilian Family Health Strategy: barriers, advances and challenges. Ciênc. Saúde Coletiva 2014; 19(2): 373-82. [http://dx.doi.org/10.1590/1413-81232014192.21652012] , 8Souza TMS, Roncalli AG. Oral health in the Brazilian Family Health Program: A health care model evaluation. Cad Saude Publica 2007; 23(11): 2727-39. [http://dx.doi.org/10.1590/S0102-311X2007001100020] , 19Baldani MH, Fadel CB, Possamai T, Queiroz MGS. Inclusion of oral health services in the Family Health Program in the State of Paraná, Brazil. Cad Saude Publica 2005; 21(4): 1026-35. [http://dx.doi.org/10.1590/S0102-311X2005000400005] , 20Soares FF, Figueiredo CRV, Borges NCM, Jordão RA, Freire MCM. Oral health teamwork in brazilian family healthcare strategy: an analysis of studies published between 2001 and 2008. Ciênc. Saúde Coletiva 2011; 16(7): 3169-80. [http://dx.doi.org/10.1590/S1413-81232011000800017] , 22Rodrigues AAAO, Bonfim LS. Oral health in the family health program of a municipality of the semi-arid region of bahia (feira de santana): Organization and micropolitics. Rev APS 2010; 13(1): 96-108., 43Rodrigues AAAO, Assis MMA, Nascimento MAA, Fonsêca GS, Siqueira DVS. Oral health in family health strategy in a town of the bahian semiarid. Rev baiana saúde pública 2011; 35(3): 695-709., 48Chaves MC, Miranda AS. Discourse among dentists within the family healthcare program: Crisis and change of habitus within public health. Interface(Botucatu) 2008; 12(24): 153-67., 51Rodrigues AAAO, Fonsêca GS, Siqueira DVS, Assis MMA, Nascimento MAA. Oral health team practices within the family health strategy and construction (de) construction of integrality in Feira de Santana-BA. Rev APS 2010; 13(4): 476-85., 73Siqueira-batista R, Gomes AP, Albuquerque VS, Cavalcanti FOL, Cotta RMM. Education and competences for the Brazilian Unified Health System (SUS): Is it possible to find alternatives to the logic of late capitalism? Ciênc. Saúde Coletiva 2013; 18(1): 159-70. [http://dx.doi.org/10.1590/S1413-81232013000100017] ], has proved to be a complication. Instability, the precariousness of labor relations and the lack of a job and salary plan interfere with the workers' interest in the system and the commitment to work and community [43Rodrigues AAAO, Assis MMA, Nascimento MAA, Fonsêca GS, Siqueira DVS. Oral health in family health strategy in a town of the bahian semiarid. Rev baiana saúde pública 2011; 35(3): 695-709., 50Cericato GO, Garbin D, Fernandes APS. Surgeon-dentist insertion in the Family Health Program: A critical revision on the actions and evaluation methods of the Oral Health Team. RFO 2007; 12(3): 18-23.]. Another factor that may be compromising the professional's dedication to the FHS is the dissatisfaction with low remuneration [3Lourenço EC, Silva ACB, Meneghin MC, Pereira AC. The insertion of oral health services in the Family Health Program at Minas Gerais State, Brazil. Ciênc. Saúde Coletiva 2009; 14(Suppl. 1): 1367-77., 8Souza TMS, Roncalli AG. Oral health in the Brazilian Family Health Program: A health care model evaluation. Cad Saude Publica 2007; 23(11): 2727-39. [http://dx.doi.org/10.1590/S0102-311X2007001100020] , 20Soares FF, Figueiredo CRV, Borges NCM, Jordão RA, Freire MCM. Oral health teamwork in brazilian family healthcare strategy: an analysis of studies published between 2001 and 2008. Ciênc. Saúde Coletiva 2011; 16(7): 3169-80. [http://dx.doi.org/10.1590/S1413-81232011000800017] , 48Chaves MC, Miranda AS. Discourse among dentists within the family healthcare program: Crisis and change of habitus within public health. Interface(Botucatu) 2008; 12(24): 153-67. ], and/or the salary discrepancy with other members with a college degree of the family health team [18Cruz DB, Nascimento AC, Moysés SJ, Ditterick RG, Gabardo MCL. Working process in the family health strategy: a perspective from the oral health team. Rev APS 2009; 12(2): 168-75., 19Baldani MH, Fadel CB, Possamai T, Queiroz MGS. Inclusion of oral health services in the Family Health Program in the State of Paraná, Brazil. Cad Saude Publica 2005; 21(4): 1026-35. [http://dx.doi.org/10.1590/S0102-311X2005000400005] , 48Chaves MC, Miranda AS. Discourse among dentists within the family healthcare program: Crisis and change of habitus within public health. Interface(Botucatu) 2008; 12(24): 153-67.]. Studies also reported failure to meet the weekly workload recommended by the MoH of 40 hours [8Souza TMS, Roncalli AG. Oral health in the Brazilian Family Health Program: A health care model evaluation. Cad Saude Publica 2007; 23(11): 2727-39. [http://dx.doi.org/10.1590/S0102-311X2007001100020] , 43Rodrigues AAAO, Assis MMA, Nascimento MAA, Fonsêca GS, Siqueira DVS. Oral health in family health strategy in a town of the bahian semiarid. Rev baiana saúde pública 2011; 35(3): 695-709.] and this may interfere in the formation of the link with the community and in the development of prevention, promotion and rehabilitation activities [8Souza TMS, Roncalli AG. Oral health in the Brazilian Family Health Program: A health care model evaluation. Cad Saude Publica 2007; 23(11): 2727-39. [http://dx.doi.org/10.1590/S0102-311X2007001100020] ]. In this sense, the municipalities should ensure full-time compliance by all professionals [2Brasil. Ministério da Saúde. Portaria n° 648, de 28 de março de 2006. Aprova a Política Nacional de Atenção Básica, estabelecendo a revisão de diretrizes e normas para a organização da Atenção Básica para o Programa Saúde da Família (PSF) e o Programa Agentes comunitários de Saúde (PACS). Brasília. Diário Oficial da União, 29 Mar, 2006.]. Another factor that was characterized as a challenge for the OHT was the repressed demand, reported by some authors [3Lourenço EC, Silva ACB, Meneghin MC, Pereira AC. The insertion of oral health services in the Family Health Program at Minas Gerais State, Brazil. Ciênc. Saúde Coletiva 2009; 14(Suppl. 1): 1367-77., 6Moraes LB, Kligerman DC, Cohen SC. Analysis on the socio-demographic profile and dental surgeon’s work process in the Family Health Program, in three cities of the mountain region of the state of Rio de Janeiro. Physis 2015; 25(1): 171-86. [http://dx.doi.org/10.1590/S0103-73312015000100010] , 20Soares FF, Figueiredo CRV, Borges NCM, Jordão RA, Freire MCM. Oral health teamwork in brazilian family healthcare strategy: an analysis of studies published between 2001 and 2008. Ciênc. Saúde Coletiva 2011; 16(7): 3169-80. [http://dx.doi.org/10.1590/S1413-81232011000800017] , 40Faccin D, Sebold R, Carcereri DL. Work process in oral health: Seeking different looks to understand and transform the reality. Ciênc. Saúde Coletiva 2010; 15(1): 1643-52. [http://dx.doi.org/10.1590/S1413-81232010000700076] , 43Rodrigues AAAO, Assis MMA, Nascimento MAA, Fonsêca GS, Siqueira DVS. Oral health in family health strategy in a town of the bahian semiarid. Rev baiana saúde pública 2011; 35(3): 695-709., 46Farias MR, Sampaio JJC. Integrating oral health team at the family health strategy: The professionals perception Rev baiana saúde pública 2011; 34(4): 745-57., 48Chaves MC, Miranda AS. Discourse among dentists within the family healthcare program: Crisis and change of habitus within public health. Interface(Botucatu) 2008; 12(24): 153-67., 49Scherer CI, Scherer MDA. Advances and challenges in oral health after a decade of the “Smiling Brazil” Program. Rev Saude Publica 2015; 49: 98. [http://dx.doi.org/10.1590/S0034-8910.2015049005961] , 51Rodrigues AAAO, Fonsêca GS, Siqueira DVS, Assis MMA, Nascimento MAA. Oral health team practices within the family health strategy and construction (de) construction of integrality in Feira de Santana-BA. Rev APS 2010; 13(4): 476-85. ], which can lead to an excessive workload and interfere with the OHT's performance in integrating with the team and complying with the principle of access universality. In addition, it can lead to the dentist wear [40Faccin D, Sebold R, Carcereri DL. Work process in oral health: Seeking different looks to understand and transform the reality. Ciênc. Saúde Coletiva 2010; 15(1): 1643-52. [http://dx.doi.org/10.1590/S1413-81232010000700076] ], be associated with the compromise of the quality of the service [48Chaves MC, Miranda AS. Discourse among dentists within the family healthcare program: Crisis and change of habitus within public health. Interface(Botucatu) 2008; 12(24): 153-67. ], and hinders forming the link with the assigned population [43Rodrigues AAAO, Assis MMA, Nascimento MAA, Fonsêca GS, Siqueira DVS. Oral health in family health strategy in a town of the bahian semiarid. Rev baiana saúde pública 2011; 35(3): 695-709.] and maintaining the service offer [31Maia LS, Kornis EMA. Reorganization of oral health care after federal incentives: Rio de Janeiro experience. Rev APS 2010; 13(1): 84-95.]. Another issue, already pointed out as a “critical node” by Baldani et al. [19Baldani MH, Fadel CB, Possamai T, Queiroz MGS. Inclusion of oral health services in the Family Health Program in the State of Paraná, Brazil. Cad Saude Publica 2005; 21(4): 1026-35. [http://dx.doi.org/10.1590/S0102-311X2005000400005] ], in 2001 in Paraná, was the difficulty of referrals of complex cases, a fact confirmed in later studies [8Souza TMS, Roncalli AG. Oral health in the Brazilian Family Health Program: A health care model evaluation. Cad Saude Publica 2007; 23(11): 2727-39. [http://dx.doi.org/10.1590/S0102-311X2007001100020] , 18Cruz DB, Nascimento AC, Moysés SJ, Ditterick RG, Gabardo MCL. Working process in the family health strategy: a perspective from the oral health team. Rev APS 2009; 12(2): 168-75., 20Soares FF, Figueiredo CRV, Borges NCM, Jordão RA, Freire MCM. Oral health teamwork in brazilian family healthcare strategy: an analysis of studies published between 2001 and 2008. Ciênc. Saúde Coletiva 2011; 16(7): 3169-80. [http://dx.doi.org/10.1590/S1413-81232011000800017] ]. One of the bases of the reorientation of oral health, described in Decree 267/2001, is the integrality of the care provided to the enrolled population; however, guaranteeing this right has become a challenge for oral health, since the expansion of the secondary and tertiary care network did not keep pace with the growth in PHC's service offers. With this in mind, and in order to increase care with services offered at the secondary and tertiary levels, the federal government created a financial contribution to the PNSB for the implantation and/or improvement of DSCs [29Brasil Ministério da Saúde Secretaria de Atenção à Saúde Departamento de Atenção Básica Coordenação Nacional de Saúde Bucal Diretrizes da Política Nacional de Saúde Bucal 2004., 74Pedrazzi V, Dias KRHC, Rode SM. Oral health in Brazil - Part II: Dental Specialty Centers (CEOs). Braz Oral Res 2008; 22(Suppl. 1): 18-23. [http://dx.doi.org/10.1590/S1806-83242008000500004] ], and ordinance 648/2006 placed the municipalities in charge of organizing the flow of users and guaranteeing their reference to services outside the scope of PHC [2Brasil. Ministério da Saúde. Portaria n° 648, de 28 de março de 2006. Aprova a Política Nacional de Atenção Básica, estabelecendo a revisão de diretrizes e normas para a organização da Atenção Básica para o Programa Saúde da Família (PSF) e o Programa Agentes comunitários de Saúde (PACS). Brasília. Diário Oficial da União, 29 Mar, 2006.]. However, it is not recommended to open DSCs in municipalities that do not have a properly structured PHC [75Chaves SCL, Barros SG, Cruz DN, Figueiredo ACL, Moura BLA, Cangussu MCT. Brazilian oral health policy: Factors associated with comprehensiveness in health care. Rev Saude Publica 2010; 44(6): 1005-13. [http://dx.doi.org/10.1590/S0034-89102010005000041] ]. However, a recent study has shown that DSCs are failing to absorb the demand for specialized treatment, generating large queues and compromising the wholeness of care [42Aquilante AG, Aciole GG. Oral health care after the national policy on oral health - "Smiling Brazil": A case study. Ciênc saúde coletiva 2015 Jan; 20(1): 239-48., 76Martins RC, Reis CMR, Matta-Machado ATG, Amaral JHL, Werneck MAF, Abreu MHNG. Relationship between primary and secondary dental care in public health services in Brazil. PLoS One 2016; 11(10): e0164986. [http://dx.doi.org/10.1371/journal.pone.0164986] ]. “The FHS approach to the dentist work goes far beyond clinical work because it is a logic of thinking about health in a comprehensive and extended way” [50Cericato GO, Garbin D, Fernandes APS. Surgeon-dentist insertion in the Family Health Program: A critical revision on the actions and evaluation methods of the Oral Health Team. RFO 2007; 12(3): 18-23.]. “In the context of oral health, public health policies must guarantee access to comprehensive dental care for vulnerable individuals” [77Costa SM, Nickel DA, Borges CM, Campos ACV, Verdi MIM. National oral health policy and bioethics of protection in integral care. Rev Bioet 2012; 20(2): 342-8.]. In this sense, the provision of oral health services in Brazil has advanced from a panorama of the limited supply of procedures of low complexity to the accomplishment of specialized procedures, aiming at the integrality of the care [34Kornis GEM, Maia LS, Fortuna RFP. Dental care financing evolution in the SUS: analysis of the process of health care reorganization in relation to federal incentives. Physis 2011; 21(1): 197-215. [http://dx.doi.org/10.1590/S0103-73312011000100012] ]. However, to Costa et al. [77Costa SM, Nickel DA, Borges CM, Campos ACV, Verdi MIM. National oral health policy and bioethics of protection in integral care. Rev Bioet 2012; 20(2): 342-8.] “there is still a lot to do so that, in fact, healthcare is integral”. The structuring of care implemented in PHC and access to secondary care directly influence care completeness [78Silva HEC, Gottems LBD. The interface between primary and secondary care in dentistry in the Unified Health System (SUS): An integrative systematic review. Ciênc saúde coletiva 2017 Aug; 22(8): 2645-57.]. Thus, the oral health care network needs to be expanded, refined and solidified [79Pucca-Junior GA, Gabriel M, de Araujo ME, de Almeida FC. Ten years of a national oral health policy in Brazil: Innovation, Boldness, and Numerous Challenges. J Dent Res 2015; 94(10): 1333-7. [http://dx.doi.org/10.1177/0022034515599979] ]. The federal government's proposal to include OHTs in the FHS, replacing the traditional models of oral health care, was an important step towards bringing dental care to the population in a more ethical and equitable manner, with a focus on family and making the teams responsible for the oral health problems of the population of a geographically delimited territory, in accordance with the UHS principles. In fact, with the increase in the financial contribution destined by the federal government to this area, a great change has taken place in the epidemiological scenario of oral health, with improvements in the indicators regarding the population's access to dental treatment. Nevertheless, studies also report the absence of a positive impact on the quality of the dental service, when comparing areas with or without OHT inserted in the FHS. The literature points as causes: lack of planning for the insertion of the OHT, the lack of qualification of the professionals to integrate the FHS, the precariousness of the form of hiring and the employment bond, the devaluation of the professionals, the difficulties of changing the work process and integration of the OHT with the rest of the family health team, and the technical training of the dentist. Therefore, the financial investment alone was not sufficient to meet all the proposals of the PNSB, and that even after 15 years of the implementation of the OHT in the FHS, many changes are still necessary. In addition to a plan by the managers for the implementation of the OHT in the FHS of their municipalities, it is necessary to train and value the professionals, in order to have a real commitment of the OHT with the population and with the new care model. This study was supported by the Conselho Nacional de Desenvolvimento Científico e Tecnológico (CNPq – National Council for Scientific and Technological Development) and the Research Program of the Faculdade Dinâmica do Vale do Piranga (PROAPP/FADIP). Brasil Ministério da Saúde Programa Saúde da Família 1994. Brasil. Ministério da Saúde. Portaria n° 648, de 28 de março de 2006. Aprova a Política Nacional de Atenção Básica, estabelecendo a revisão de diretrizes e normas para a organização da Atenção Básica para o Programa Saúde da Família (PSF) e o Programa Agentes comunitários de Saúde (PACS). Brasília. Diário Oficial da União, 29 Mar, 2006. Lourenço EC, Silva ACB, Meneghin MC, Pereira AC. The insertion of oral health services in the Family Health Program at Minas Gerais State, Brazil. Ciênc. Saúde Coletiva 2009; 14(Suppl. 1): 1367-77. Brasil. Ministério da Saúde. Portaria n° 1.444, de 28 de dezembro de 2000. Estabelece o incentivo financeiro para a reorganização da atenção à saúde bucal prestada nos municípios por meio do Programa Saúde da Família. Brasília. Diário Oficial da União, 29 Dez, 2000. Brasil. Ministério da Saúde. Portaria n°267, de 6 de março de 2001. Define as diretrizes e normas da inclusão das ações de saúde bucal no PSF. Brasília. Diário Oficial da União, 07 Mar, 2001. Costa RM, Medeiros-Júnior A, Costa ICC, Pinheiro IVA. Working process of dentist in the family health strategy of parnamirim-RN: Facing the challenges of a new care model. Rev Odontol Bras Central 2010; 19(51): 327-32. Brasil. Ministério da Saúde. Departamento de Atenção Básica. Histórico de cobertura Saúde da Família. Disponível em: http:// dab.saude.gov.br/ portaldab/ historico_cobertura_sf.php Acesso em: 17 nov. 2016. Brasil. Ministério da Saúde. Sistema de Informações Ambulatoriais do SUS (SIA-SUS). Disponível em: http:/ /www2.datasus.gov.br/ DATASUS/ index.php?area=0202& id=19122&VObj=http://tabnet.datasus.gov.br/cgi/deftohtm.exe?sia/cnv/qa Acesso em: 17 nov. 2016. Farias MR, Sampaio JJC. Role of the dental surgeon in the family health team. RGO -. Rev Gaucha Odontol 2011; 59(1): 109-15. Santiago WK, Werneck MAF, Ferreira EDE. The process of implementing dental care with in the family health care program in Belo Horizonte/MG: A qualitative study based on the perception of the oral health care coordination team and dental surgeons from the family health care program. Arquivos em Odontologia 2009; 45(4): 211-9. Cruz DB, Nascimento AC, Moysés SJ, Ditterick RG, Gabardo MCL. Working process in the family health strategy: a perspective from the oral health team. Rev APS 2009; 12(2): 168-75. Brasil. Ministério da Saúde. Portaria n° 673, de 03 de junho de 2003. Atualiza e revê o incentivo financeiro às Ações de Saúde Bucal: portaria de normas e diretrizes da saúde bucal. Brasília. Diário Oficial da União, 04 Jun, 2003. Rodrigues AAAO, Bonfim LS. Oral health in the family health program of a municipality of the semi-arid region of bahia (feira de santana): Organization and micropolitics. Rev APS 2010; 13(1): 96-108. Brasil. Ministério da Saúde. Portaria n° 74, de 20 de janeiro de 2004. Reajusta os valores dos incentivos financeiros às Ações de Saúde Bucal: Portaria de normas e diretrizes da saúde bucal. Brasília. Diário Oficial da União, 21 Jan, 2004. .
 Brasil. Ministério da Saúde. Portaria n°650, de 28 de março de 2006. Define valores de financiamento do PAB fixo e variável mediante a revisão de diretrizes e normas para organização da Atenção Básica, para a estratégia de Saúde da Família e para o Programa de Agentes Comunitários de Saúde. Brasília. Diário Oficial da União, 29 Mar, 2006. Brasil. Ministério da Saúde. Portaria n°2489, de 21 de outubro de 2008. Define valores de financiamento do Piso da Atenção Básica Variável para a Estratégia de Saúde da Família e de Saúde Bucal, instruídos pela Política Nacional de Atenção Básica. Brasília. Diário Oficial da União, 22 Out, 2008. Brasil. Ministério da Saúde. Portaria n°3066, de 23 de dezembro de 2008. Define Valores de Financiamento do Piso da Atenção Básica Variável para a Estratégia de Saúde da Família e de Saúde Bucal, instruídos pela Política Nacional de Atenção Básica. Brasília. Diário Oficial da União, 24 Dez, 2008. Brasil. Ministério da Saúde. Portaria no 1.599, de 9 de julho de 2011 Define valores de financiamento do Piso da Atenção Básica Variável para as Equipes de Saúde da Família, Equipes de Saúde Bucal e aos Agentes Comunitários de Saúde, instituídos pela Política Nacional de Atenção Básica. Brasília. Diário Oficial da União, 11 Jul, 2011. Brasil. Ministério da Saúde. Portaria n°978, de 16 de maio de 2012. Define valores de financiamento do Piso da Atenção Básica variável para as Equipes de Saúde da Família, Equipes de Saúde Bucal e aos Núcleos de Apoio à Saúde da Família, instituídos pela Política Nacional de Atenção Básica. Brasília. Diário Oficial da União, 17 Mai, 2012. Brasil Ministério da Saúde Secretaria de Atenção à Saúde Departamento de Atenção Básica Coordenação Nacional de Saúde Bucal Diretrizes da Política Nacional de Saúde Bucal 2004. Maia LS, Kornis EMA. Reorganization of oral health care after federal incentives: Rio de Janeiro experience. Rev APS 2010; 13(1): 84-95. Brasil. Ministério da Saúde. Portaria n°.2372, de 7 de outubro de 2009. Cria o plano de fornecimento de equipamentos odontológicos para as Equipes de Saúde Bucal na Estratégia Saúde da Família. Brasília. Diário Oficial da União, 08 Out, 2009. Pucca-junior GA, Lucena EHG, Cawahisa PT. Financing national policy on oral health in Brazil in the context of the Unified Contextualization of the National Oral Health Policy. Braz Oral Res 2010; 24(Spec Iss 1): 26-32. Macêdo MS, Chaves SC, Fernandes AL. Investments and costs of oral health care for Family Health Care. Rev Saude Publica 2016; •••: 50. Barbosa AAA, Brito EWG, Costa ICC. Oral health care in the family health program, from its implementation to today’s moment: Perceptions of dentists and assistants in municipality context. Ciênc Odontol Bras 2007; 10(3): 53-60. Fernandes JKB, Pinho JRO, Queiroz RCS, Thomaz EBAF. Evaluation of oral health indicators in Brazil: A trend towards equity in dental care? Cad Saude Publica 2016; 32(2): e00021115. Brunhauser AL, Magro ML, Neves M. Evaluation of oral health services: A comparative study. RFO 2013; 18(1): 24-31. Aquilante AG, Aciole GG. Oral health care after the national policy on oral health - "Smiling Brazil": A case study. Ciênc saúde coletiva 2015 Jan; 20(1): 239-48. Rodrigues AAAO, Assis MMA, Nascimento MAA, Fonsêca GS, Siqueira DVS. Oral health in family health strategy in a town of the bahian semiarid. Rev baiana saúde pública 2011; 35(3): 695-709. Farias MR, Sampaio JJC. Integrating oral health team at the family health strategy: The professionals perception Rev baiana saúde pública 2011; 34(4): 745-57. Nascimento AC, Moysés ST, Werneck RI, Moysés SJ. Oral health in the context of primary care in Brazil. Int Dent J 2013; 63(5): 237-43. Chaves MC, Miranda AS. Discourse among dentists within the family healthcare program: Crisis and change of habitus within public health. Interface(Botucatu) 2008; 12(24): 153-67. Cericato GO, Garbin D, Fernandes APS. Surgeon-dentist insertion in the Family Health Program: A critical revision on the actions and evaluation methods of the Oral Health Team. RFO 2007; 12(3): 18-23. Rodrigues AAAO, Fonsêca GS, Siqueira DVS, Assis MMA, Nascimento MAA. Oral health team practices within the family health strategy and construction (de) construction of integrality in Feira de Santana-BA. Rev APS 2010; 13(4): 476-85. Brasil. Conselho Nacional de Educação. Câmara de Educação Superior Diretrizes curriculares nacionais do curso de Graduação em Odontologia. Brasília, Diário Oficial da União, 04 Mar, 2002. Neves M, Giordani JM, Ferla AA, Hugo FN. Primary care dentistry in Brazil: From prevention to comprehensive care. J Ambul Care Manage. 2017 Apr/Jun;40 Suppl 2 Supplement, The Brazilian National Program for Improving Primary Care Access and Quality (PMAQ):S35-S48. Brasil Ministério da Saúde Saúde Bucal - Cadernos de Atenção Básica 17 2006. Junqueira SR, Pannuti CM, Rode SM. Oral health in Brazil – Part I : Public oral health policies. Braz Oral Res 2008; 22(Spec Iss 1): 8-17. Brasil. Ministério da Saúde. Departamento de Informática do SUS. Indicadores de cobertura. Disponível em: http:// tabnet.datasus.gov.br/ cgi/ dh.exe?idb2012/f2102.def >.Acesso Acesso em:20 nov. 2016. Corrêa GT, Celeste RK. Association between coverage by oral health teams in the family health and the increase in dental care output in Brazilian municipalities, 1999 and 2011. Cad Saude Publica 2015; 31(12): 2588-98. Pereira IF, Sales GLD, Cunha DA, et al. Evolution of the family health strategy oral health coverage in municipalities in Paraíba. Rev APS 2014; 17(1): 44-9. Marin J, Machado MTC, Gouvêa MV, Mayernyik MA. From the integrity of a program to the necessary amalgam: The introduction of the oral health teams into the family health strategy in the city of Niteroi in the state of Rio de Janeiro. Rev APS 2014; 17(1): 32-9. Soares CLM. Constructing public oral health policies in Brazil : Issues for reflection. Braz Oral Res 2012; 26(Spec Iss 1): 94-102. Costa SM, Nickel DA, Borges CM, Campos ACV, Verdi MIM. National oral health policy and bioethics of protection in integral care. Rev Bioet 2012; 20(2): 342-8. Silva HEC, Gottems LBD. The interface between primary and secondary care in dentistry in the Unified Health System (SUS): An integrative systematic review. Ciênc saúde coletiva 2017 Aug; 22(8): 2645-57.